A very short trip down the last (realistically) paddleable section of the wonderful Crystal River is sparse on unique features, scenery or excitement, but it’s still a pleasant afternoon trip, or a dessert to the main course upstream, or even a fine introduction to paddling for beginners. Gauge notes: This is a correlative gauge located on the Waupaca River. This is the recommended minimum level. While the current was swift at times, there were other times where I was floating above an inch of water which might cause some walking if it were lower. Time: Put in at 3:40. Out at 5:00. Wildlife: Fish, ducks, deer, a hawk and two woodpeckers. The first time I ever paddled the Crystal River I stopped into the Red Mill on a recon of sorts. I asked the owners (who just purchased the property) about the downstream section looking for an ideal take-out beyond the park next door (because I wanted to paddled beneath their covered bridge, of course). They said that folks paddle it to Waupaca all the time. At the time, I wasn’t planning on making my way that far, not knowing how far that was, and I didn’t have it mapped so I chose to take-out just downstream at Shadow Lake Road (and then on every subsequent trip) because of its convenience. Yet it’s always been in the back of my head to see what lies further beyond Shadow Lake Road, and now was the time to see for myself. 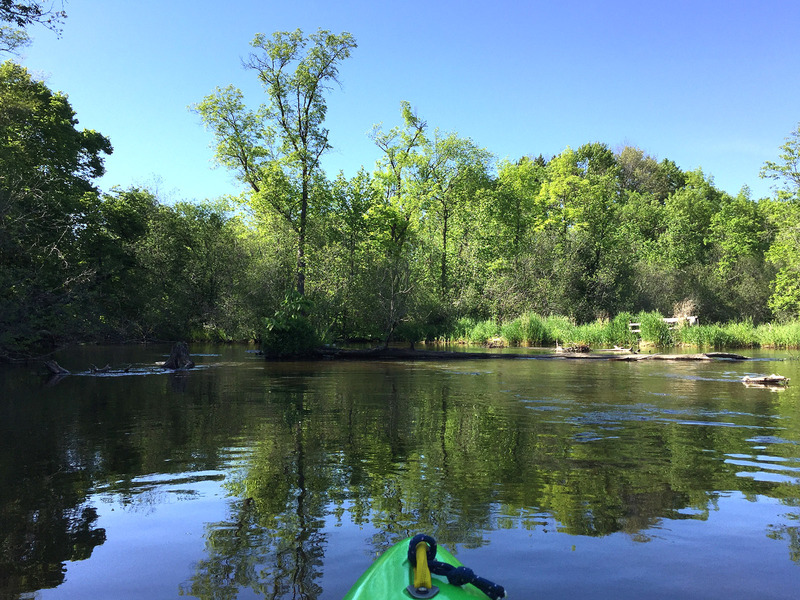 My initial plan was to meet the confluence of the Waupaca and take-out somewhere in town but the millpond is quite slack and the appearance is well, disgusting. More importantly, there really isn’t anywhere to take-out that wouldn’t be trespassing. The only other access point upstream at Berlin Street is also off-limits. One would also be clearly trespassing there as well, and it’s really not accommodating for parking or launching. So I was scratching my head as to where to take-out until I went to my intended put-in on Shadow Lake Road. Upon my arrival I saw a group of kayakers heading beneath the bridge so I yelled “where are you taking out?” knowing they couldn’t possibly be headed toward the Millpond. They said “Shadow Lake!” So I looked it up on my map and that’s where I headed, trusting that if they were taking-out there, then it all must be connected though I didn’t actually see that on the map (and indeed it was). When I arrived at Shadow Lake, I found a couple take-outs, one being a sizeable boat landing/launch just across the lake from where’d I’d eventually return from the Crystal River. After recalculating and wanting to make the most of my day (and what was becoming a very short trip), I decided to put-in at Peter Nelson Park at the Red Mill due to easy access, paddling beneath that beautiful Red Covered bridge once again, and also because I knew there was some riffles and fun to be had up to Shadow Lake Road. Just before I put-in, I crossed the road to check out the dam – or at least, where there once lived a dam that created a huge millpond. Two visits ago, we had to portage the dam. One visit ago, the dam gate was removed and it was runnable (fun, at that), creating a very interesting upstream section, where the river was still finding itself once again. This visit, the dam was completely gone. Amazing, really. The put-in is easy with multiple places in the small park to choose to launch. Just after setting off, you’ll come upon the big old wagon wheel, then the delightful covered bridge. After a small jog, there are a few riffles (really the last notable amount of them throughout this stretch) just upstream of the shooting/archery range. There, they carry you under a footbridge. On this trip there actually were people at the range doing whatever shooting range people do, (oh, shoot, right?) so it was here where I paddled a little faster so as not to get a foreign object stuck in my neck. From there the surroundings become a little more gnarled until coming upon some backyards and eventually the Shadow Lake Road bridge. After Shadow Lake Road, there really isn’t much that resembles the upper stretch. I wish there were more exciting secrets to share that we uncovered on this leg, but there really wasn’t. Save for one uniquely-decrepit bridge (which may need to be portaged in high-water due to its low-clearance) the surroundings are rather austere. Don’t take that as a bad thing though – it’s still the Crystal River for God’s sake – meaning crystal clear water – continually crystal clear even if it’s four-feet deep! The surroundings are what I expected. The creek alternates between low grassy banks on one side and usually gnarly tree carnage on the other. It’s sometimes marshy or brushy, and sometimes the floor gets a little muddy but it usually holds its characteristically sandy-bottomed self. There were a few boulders, which are kind of the signature of the Waupaca/Crystal river area, but nothing like the gardens upstream. It’s certainly pleasant but there was really nothing overly exciting – no riffles nor anything challenging – which was totally fine because it gave me time to spot fish and watch for deer on the banks. It’s pretty in a very understated way. And though I found it relaxing, those with little tolerance for artificial environmental noise will be bothered by the volume of the impending meeting with Highway 10, especially as you make your last leg towards and beneath it. It’s got a buzz. A honk. Or several. And even a shimmy that’ll catch your ear. Almost immediately after the highway, you’ll spot a hand-lettered sign indicating the path towards Shadow Lake. Turning left will lead you down a short corridor that you’ll follow until the lake reveals itself. Just across the lake is the boat landing with plenty of parking – and on this day quite abuzz with plenty of paddlers. In fact, I was surprised by the number of paddlers who were out traveling this same stretch that day – busier than I would’ve ever anticipated – but there is an appeal to this little stream and this section is perfect for beginners just getting their paddles wet. It’s the Crystal River isn’t that enough? Seriously, it’s not big on excitement but it’s subtle beauty is a perfect little day trip (little being the keyword as it’s short). Add to that the easy access points, this is a great trip for beginners who want to see what a river has to offer. Nothing really related to the paddle as it met my expectations, certainly tempered from the reserach I had done. It’s been well-documented that Hartman Creek State Park is one of my favorite places to camp, but man have the raccoons gotten ballsy there. Just after arriving, I was piling up my firewood (it wasn’t even dusk) when in waltzes a raccoon about 10-feet from my Chacos. I look at it. It looks at me – no, more like glares at me (from beneath its stupid little mask). It looks around a few times like it owns the place and casually saunters by. But then it comes back – again, just leisurely strolling through. But then it returns a few more times – coming and going – like it owns the place or maybe casing the joint? It was this experience where I asked myself, “what’s the point of a raccoon?” Seriously. It seems the only time I ever see them in nature, they’re in my campsite stealing a brat from my grill, a bag of kettle chips off my picnic table or when I shine my maglite up in the trees at night to spot their beady little eyes eyeing me – just waiting for their next opportunity to thieve something. Now Hartman’s racoons aren’t as bad as Devil’s Lake’s raccoons – no, those creatures are more plentiful, more daring and more hearty because it’s like a casino buffet at that park, just due to the sheer number of unsuspecting campers. But still, I do have to wonder, is anyone studying the dieting habits of Wisconsin state park raccoons? I’m sure it would make for a great case study for one reason or another. It certainly could be affecting their brazen egos. 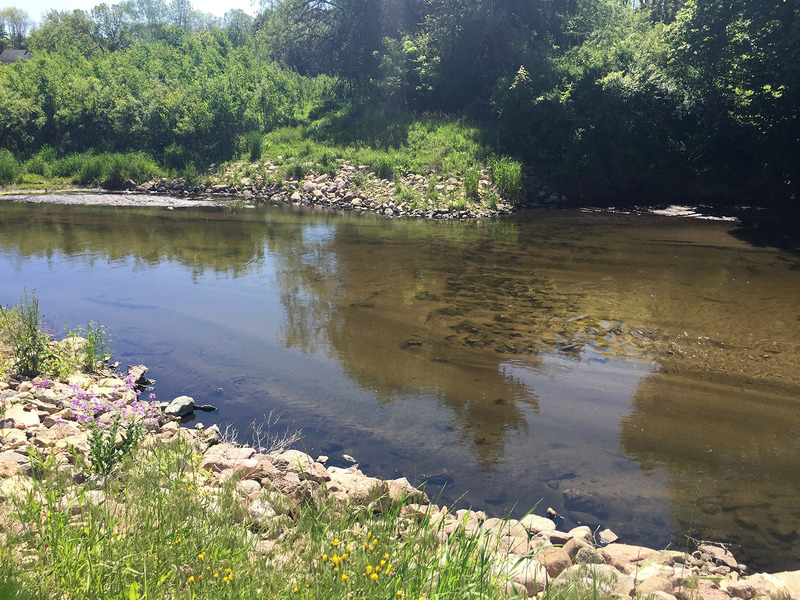 The popular section of the Crystal River is popular for a reason, yet this is a fine addition if you want to skip the lakes section (which is great because the headwaters of the creek are amazing) but want to extend your Crystal experience. Though there’s not a lot to discover within these specific few miles, I’m glad I scratched that wondering itch. It’s fun to have explored the rest of the paddleable Crystal River. The entire river, I swear, is the most varied river in central Wisconsin; A turquoise lake, corridors, more lakes, headwaters to a river, riffles, boulder gardens, a charming manicured village, bridges, lakes, light whitewater, ledges, prairie, a recently-renewed river, an old mill, covered bridge, shooting range, scrubby trees, back to lake? That’s quite a diverse complexion for a short river like the Crystal and that makes it all the more appealing. The shuttle starts easy enough on the city’s Wau-King-Trail (heading west on Highway 22) but it gets a little hairy after turning south towards Little Hope on Highway K because there’s really no shoulder that accommodates bikers (or in our case, bikers with paddles and a pfd attached to the frame). But it’s a short (cross-your-fingers and wear a helmet) distance from there to Peter Nelson Park next to the Red Mill. Welcome to Peter Nelson Park. The put-in just downstream from the County Highway K bridge. Here comes the shooting range. There’s a few small boulders. The widest I’ve seen the Crystal up to this point. In higher water, this may be a challenge. Just beyond this tree is the bridge which is already tight to the water. And the current is moving here too. A familiar look downstream of Shadow Lake Road. A little bit of visual civilization. Loved some of the grasses, especially with the reflections. The last short straightaway before decision time. The boat landing take-out on Shadow Lake.